Congratulations on your prestigious award at the Home Show! Your designs always stand out from the rest. I ask realtors showing our home to make mention that is is a Cannon home. Buyer responses are always positive! Our wishes to you both for continued success! I am building a new home with this company. I thoroughly researched the builders in my area by interviewing several and speaking at length with friends who have built homes in the area before settling on John Cannon Homes. The process from my first meeting with the sales staff to my initial meetings with architects and planners to the complete design center where everything was chosen before construction began was well orchestrated, professionally done, and extremely thorough. This allowed us to have a firm grasp on costs before we began construction with a clear understanding that changes could be made and how additional costs would be computed. The construction process was not without the usual bumps with subs not showing up or leaving, but the job was railroaded by an incredible superintendent manager, Brett Bennett, who was constantly on top of everything. Having built and extensively remodeled homes in the past, this experience was incredible. I have never seen anyone more involved and on top of a project before. I wanted to reach out to thank you and tell you how happy we are with our new John Cannon home here in Eaglescliffe. It all started with your salesperson working with us remotely (we were living in Budapest at the time) to show us how he could make the Talia model fit our needs and our budget. He worked hard and quickly and proved he really was listening to what we wanted. Then - we spent a lot of time with your design liaison remotely and in an intensive in-person design session a year ago April to make design selectors that turned out fantastically. She came up with great options, and, importantly, as we had questions, she was super responsive and helpful. Everything we chose together worked out perfectly. Finally, we can't say enough good things about how our project manager managed the project and continues to this day staying in touch to make sure we are satisfied customers. I was communicating with him via email from Europe in the middle of the night in the USA and I could count on him to be right back to me very, very early any morning I sent him an email. And he always has a "can do" approach to all our requests. He is just simply great to work with. Congratulations Mr. Cannon on building such a great team. It's clear you have set the right direction on being customer focused and highly responsive as the home building process unfolds. 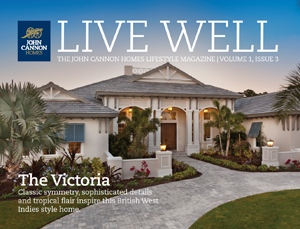 We're proud to be John Cannon homeowners. You create wonderful homes. If you ever need someone to advocate on your behalf (especially if Blaise is involved), please do not hesitate to call upon us. With all sincerity we can speak to the intense effort you and every member of your team invest in satisfying the wishes of a future Sarasota community resident. We believe you view each of us as neighbors from the moment we are introduced. That personal connection defines you and separates you from all those who simply build houses and not homes. Maintain that goal as your beacon and you will succeed in far more than creating a successful business model. Carry on! We are in our terrific new home. Mary and I want to thank you for your support throughout this process. Wherever we touched John's team, we found expertise, responsiveness, and great follow through. That never happens by accident. Thank you, John. Each of you excelled in your respective areas of contribution. Evan Grigoli initiated the process and did a great job of capturing our needs and answering our questions. Jill Stafford did a fantastic job of guiding all those decisions that ultimately set the tone for a home. Tony Farese was so meticulous that he made me realize that when it comes to details, I'm in the minor leagues. He knows how to make things happen. Sheila Samuel worked closely with us to track costs and payments. We came out spot on-between my track and her's. Tom Shumway, at our start construction orientation, said he would be involved in our home build. He was good to his word. I really appreciated his interest throughout the process. An example, we were both going through the house, I was putting blue tape on finish I questioned and Tom was following putting blue tape on stuff I missed. In the end, Tony pulled all the contributions together and made them a wonderful reality. I see in my email, there there is a survey from John Cannon Homes. Of course, I will complete the survey. However, I wanted to acknowledge in a more direct way my appreciation for each of you.